Pick Analysis: Davenport is the odds-on favorite to be the eighth offensive lineman from outside the FBS in the last ten drafts to be been selected in the top 100 picks. The cousin of former Kentucky and NBA player Michael Kidd-Gilchrist didn't have FBS offers coming out, but should have. He started all 44 games at left tackle in his career with Bucknell, earning all-conference honors each year (second team in 2013, first team from 2014-2016). The Bison's two-time team captain was named first-team All-American teams from multiple outlets in 2016, as well. Published: April 29, 2017 at 01:29 p.m. 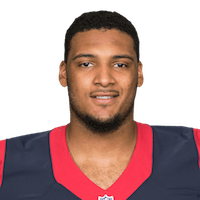 Retired NASA astronaut Scott Kelly announces the Houston Texans selection of Bucknell tackle Julie'n Davenport in Round 4 with the No. 130 overall pick in the 2017 NFL Draft. Published: April 3, 2017 at 04:42 p.m.
Bucknell offensive tackle Julie'n Davenport goes through workouts at the 2017 NFL Scouting Combine. Published: April 8, 2017 at 09:35 p.m.
Everything you need to know about Bucknell offensive tackle Julie'n Davenport.